Science Speaks: What is selenium and why is it important? D*action Magnesium + Safety is a new project from GrassrootsHealth to provide you with information about your nutrient status for many essential elements and toxins. In previous blogs we discussed what magnesium is and why it’s important for health. In this blog we will talk about the health benefits of selenium, the second essential element in this testing panel. 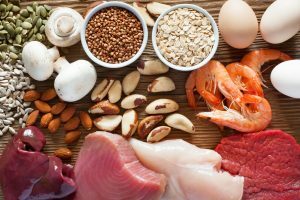 Selenium is a mineral present naturally in water and some foods including brazil nuts, walnuts, grains, beef and poultry, and seafood such as tuna, cod, red snapper, and herring. The amount of selenium in a given plant-based food source widely varies depending on soil conditions such as the amount and form of selenium in the soil, amount of organic matter in the soil, and soil pH. The amount of selenium in animal-based food sources is more stable due to animals maintaining a consistent selenium level in their tissues and use of formulated livestock feed. Selenium is also available as a dietary supplement. Why is selenium important for health? Selenium is an essential nutrient and plays a key role in thyroid function, reproduction, and DNA synthesis. It has antioxidant properties which include protecting the cell from damage and helps fight infection. Studies have found an association between higher selenium status and a lower risk of colorectal, prostate, lung, bladder, skin, and gastrointestinal cancers. Selenium may also be associated with cognitive decline and may reduce the risk of cardiovascular disease. It is estimated that up one billion people worldwide consume inadequate amounts of selenium, primarily in parts of China and some European countries where soil levels of selenium are lower. In the United States, most adults meet the recommended daily allowance (RDA) for selenium, which is 55 micrograms (mcg) per day. Individuals at a higher risk for selenium deficiency include those who live in selenium-deficient regions (including certain regions of the US such as the Pacific Northwest and parts of the Great Lakes region and Atlantic coast) and rely on locally grown food, as well as those with conditions limiting nutrient absorption such as Crohn’s disease or kidney disease. A severe deficiency of selenium may lead to impairment of anti-oxidant actions and thyroid functions. Can I consume too much selenium? Yes! While some selenium is essential to the body, excess selenium can be toxic. Symptoms of selenium toxicity include nausea, diarrhea, neurological symptoms, hair loss, heart problems, and other symptoms. The tolerable upper intake level for selenium is 400 micrograms (mcg) per day for adults. How is selenium measured in the body? One method of assessing selenium status is using dried blood spots. This test reflects both free selenium in the blood and selenium as a component of selenoproteins (proteins containing selenium). Since heavy metals bind to selenium and reduce its bioavailability, the dried blood spot test is particularly useful for determining if enough selenium is present to counteract these heavy metals in the body. The lab reference range is 132 – 247 micrograms per liter (μg/L), which is the range of the average population the lab serves. 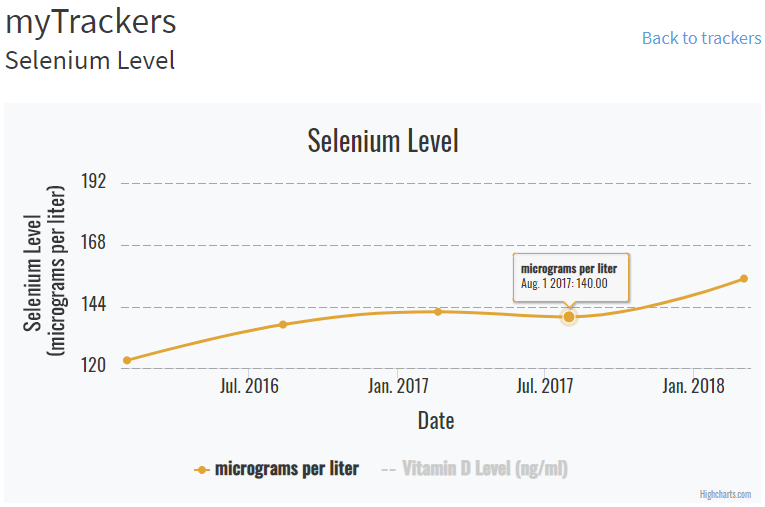 How can I track my selenium intake and level? To help you track your supplement use, dietary nutrient intake, and selenium levels, GrassrootsHealth has created an online tracking system called myData-myAnswers. For each specific supplement, you can track what days you take it, how much, and many other details. You can also track your selenium intake from dietary sources. Check it out today! NEW Magnesium Plus Elements Blood Spot Test, to test Magnesium (RBC test), other elements and heavy metals and vitamin D!